On Saturday night, after The Great New Zealand Crime Debate event at the Christchurch Writers Festival, we will find out who takes home the terrific hand-crafted art trophy designed and created by local sculptor Gina Ferguson (along with the winner's cheque - thanks to the Christchurch Writers Festival Trust - and collection of Ngaio Marsh novels - thanks to HarperCollins, Dame Ngaio's publisher). Before then, I thought it might be fun to take a closer look at each of the contenders - four days , four books and authors. In the past couple of days we kicked things off, alphabetically by author, with COLLECTING COOPER by Christchurch writer Paul Cleave, who won the 2011 Ngaio Marsh Award, and then LUTHER: THE CALLING by Wellington author Neil Cross, who is a three-time finalist. 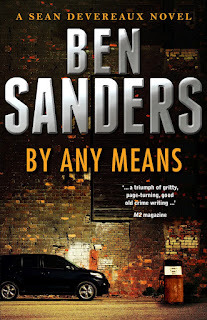 Today I am taking a look at BY ANY MEANS by young Auckland crime writer and engineer Ben Sanders, the second book in his series starring detective Sean Devereaux and his buddy, ex-cop John Hale (the third will be released later this year), following his acclaimed #1 bestselling debut, THE FALLEN (read my review of that book here). Friday rush hour. Auckland City. A lone shooter fires across a packed street and kills a man. Detective Sergeant Sean Devereaux is assigned the case. He's not complaining. His Friday nights are seldom better spent. But the inquiry is not straightforward. Witness accounts are conflicting. The dead man appears to be an unintended victim, with the true target unknown. It's a homicide that leaves police with no initial suspects, and no apparent motive. It's the least of Devereaux's worries. His current case load includes an investigation into the deaths of the wife and daughter of a wealthy finance company director names Ian Carson. Carson is claiming a murder-suicide scenario, however Devereaux is unsure. His examination soon reveals the situation is far more complex than anticipated, casting real doubt upon the division of innocence and guilt. Devereaux's former police colleague John Hale is in no position to assist. The chance witnessing of an abduction in an inner city bar leads Hale on his own pursuit of darkness. This is moral corruption and violence viewed through the wary lens of two troubled but decent men. It is a story of the hunt for truth from those that pursue self-gain by any means. BY ANY MEANS, which continues the story of Devereaux and Hale, has one heck of an opening, as a bus driver is gunned down on the packed streets of Auckland (incidentally, right across from my old office when I was a young lawyer), before taking readers on a spiralling, violent tale that reaches behind the closed doors of both the rich and poor suburbs of New Zealand's biggest city. 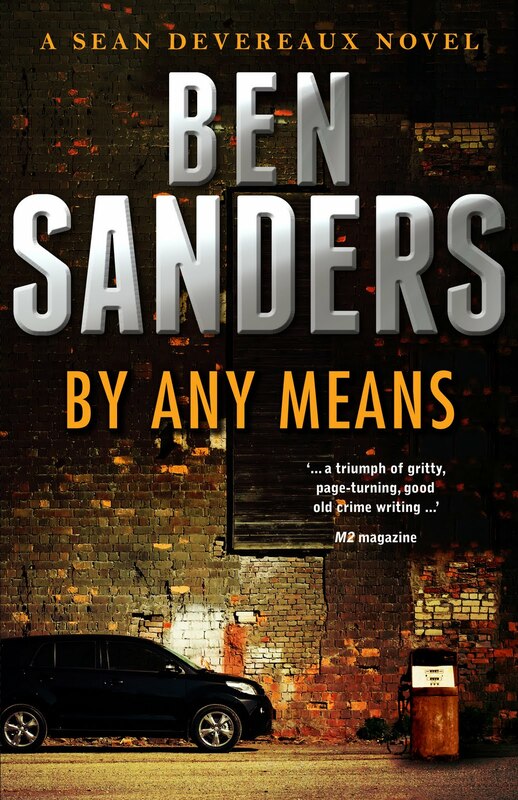 In an interview with the Weekend Herald, Sanders talked about writing BY ANY MEANS, and how - despite the longstanding tradition of the 'difficult second novel', it felt smoother and he actually enjoyed writing it even more than his debut. "The thing about being an unpublished writer is that, chances are, nothing is going to come of your efforts," he said. "Whereas with By Any Means I found it a lot easier because I was familiar with the characters and I was working towards a specific goal - I had a contract for that book." You can read that full Weekend Herald interview here. "When Sanders is writing terse, pointed, sharp and tight action BY ANY MEANS is a seriously good thriller... one of the best opening's of a book I've read in a long time..."
"This novel moves at a cracking pace ... and is infused with a dry humour that is delightful. There are some clever twists and this book is well worth reading." There were also a number of other, generally very positive, reviews in print publications which unfortunately aren't available online (and I don't have right at hand to ensure I get the quotes completely accurate). But what did the Ngaio Marsh Award judging panel think of BY ANY MEANS, which was written - like THE FALLEN - while Sanders was studying engineering at the University of Auckland? Well, clearly they liked it. The Ngaio Marsh Award judging panel, consisting of seven crime fiction experts from the United Kingdom, Germany, the United States, and New Zealand, was likewise impressed by many aspects of BY ANY MEANS, putting it through to the finals from a very tough and closely-contested long-list for the 2012 Ngaio Marsh Award. Amongst other comments, the international judging panel praised BY ANY MEANS as a “real page turner” and called Sanders “a master of the short sentence and crisp dialogue”, reminiscent of Elmore Leonard. Wow, that last comment is pretty high praise indeed. But will it be enough for first-time finalist Sanders to emerge from Saturday night with the handcrafted art trophy created by local sculptor Gina Ferguson? The youngest and newest author amongst the finalists, Sanders is facing some pretty stiff competition - from Cleave, Cross, and Symon, all of whom have penned some terrific crime thrillers that have also garnered much acclaim from critics and readers. Later, I'll take a look at the last of the contenders for the 2012 Ngaio Marsh Award. But in the meantime, have you read BY ANY MEANS? If not, does it sound like the kind of crime thriller you might like to try? Thoughts and comments most welcome.